Last week, I attended C2—the Commerce and Creativity Conference—in Montreal, Canada. It had Snoop Dog (talking about the legalization of cannabis) as the big draw, but that’s not why I wanted to go. I was primarily interested in seeing a new event experience, and evaluating how that might be applied to the B2B events we work on, which are largely tech company user conferences. Luckily for me, there was no shortage of ideas to draw on. Within days of registering for C2, I received a call from a charming woman identifying herself as Marianne, my "personal C2 concierge"—a role designed to help me get the most out of my C2 experience. She offered advice and recommendations on everything from what sessions to consider to what restaurants to try and sights to see while in Montreal. I have never been to an event that offered such high-touch service, and it struck me as such a positive way to start and forge a relationship with someone. If I were to emulate this approach, I would extend the outreach to post-event activities as well (something I have yet to see happen with C2). For example, if Marianne (a person I have forged a relationship with) asked me what I liked/didn't like about the event, I would surely tell her, and that input is so incredibly valuable to an event organizer. C2 is one place where it’s actually encouraged to have your own agenda. Instead of following a rigid formula of “keynote/breakouts/party” (rinse and repeat), C2 lets you build each day of your schedule by selecting from a combination of content formats, types and topics. Think of it as "event Legos" that allow you to build the experience you want. Attendees can select from workshops, labs, collaborative discussions, arts and celebrations, activities and coaching, and conference talks (these are typically the “headliner” speakers). Apart from the headliners, each of these sessions repeat multiple times, making it easy for attendees to build a schedule that suits their unique needs. Early birds can start the day with some group yoga and then go straight into a lab, collaborative session, or whatever. Those who operate better when the sun is fully up in the sky, can start with lunch and then have a full afternoon and evening of sessions. This ultimate flexibility puts the attendee in charge of their experience. C2 has nailed the elusive goal of actually delivering an interactive experience. In one session I attended, a group of us took a deep dive into our own minds through self-hypnosis (made possible through “mind-reading” headphones), followed by a rather interesting group discussion about how Facebook is experimenting with tailoring your social feed based on your subconscious thoughts. In other sessions, attendees baked and marketed a “guilt-free” cookie, discussed hot topics such as the future of reporting (with "fake news" being a blazing hot topic) in the “Conversation Market" and learned how birdwatching can provide insights into the way we live and work. There was even interactivity in the large sessions (with over 1,000 people), including one with Phillippe Meunier, Chief Creative Officer at Sid Lee, where each of us wrote words on a balloon and then swapped with other attendees to progressively write one massive poem. Oh, and Phillippe’s mid-session costume changes were entertaining, to say the least. The reception area for the dedicated Braindate lounge area. Building on the unique environment of C2, clusters of containers were terraced to create a sort of mesa village of gathering spots. These containers offered a range of food choices as well as hospitality suites for strategic partners. 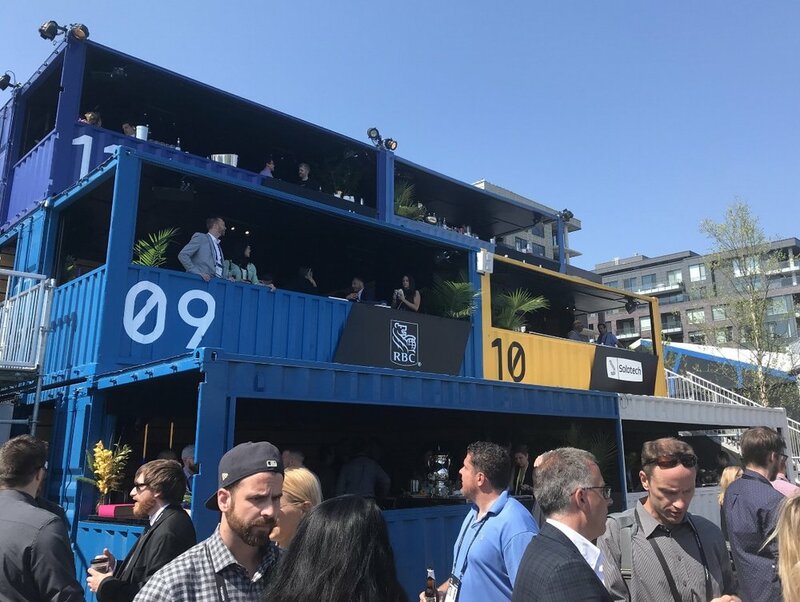 I attended an invite-only session with Box in one of these containers, and the overall vibe was laid back (which was a good thing!) and festive (free beer and wine anyone?). I mingled with other attendees, noshed on tasty treats, and got a sneak peek into some pretty interesting technology coming soon from Box (I'm especially excited about the AI-driven audio transcript and imaging tagging capabilities). It was a much more enjoyable experience than the basic booths one usually sees at a conference expo because it fit within the overall experience design and offered something relevant to attendees.